Downhill Skateboarding. The In’s, Out’s, and everything in between! Per request we have decided to do a little write up on downhill skateboarding. Not just skating down hills but actual downhill racing and speedboarding. Downhill has been around forever but until recently it has remained in the shadows of traditional skateboarding. The real O.G.’s however, have always been out there searching for bigger, gnarlier, hills to test their skills on! The sport has evolved throughout the years. Aside from product turning into seemingly space age equipment riding has undergone some big changes as well. New techniques let riders go bigger, harder, and much much faster. The downhill slide, as it was traditionally called, is one of the most important skills a downhill rider needs. You need to be able to properly slow down in order to make certain corners and turns effectively. In racing and speed boarding there are two main slides that are commonly used, frontside and backside hands-down slides. Frontside and backside are also known as heelside and toeside respectively. There are many other names for these slides, most commonly heard is the Coleman Slide which was popularized by one of the greatest downhill skateboarders of all time, Cliff Coleman. Cliff Coleman, 60 something years young and still shredding! Having one of your hands down on the ground while performing these maneuvers helps in properly de-weighting your board and effectively drifting or pre-drifting corners. Drifting is literally the action of sliding before or throughout a corner in order to make it through safely. Depending on which side you are entering the turn you will either apply weight to your front hand leaning backwards doing a heelside slide or you will use your backhand leaning backwards doing a toeside slide. But your hands don’t do all the work. You have to know how to kick your board out and how far to push it to determine how much speed to scrub off. Pushing it too far out will make your board shoot out from under you and vice versa not pushing it enough will make your wheels grip up early shooting you forwards off of your board. Finding that happy medium isn’t too hard though, it just takes a bit of practice like anything else! Powerslides are another option but they are rarely used in the world of downhill. They are however a good skill to have under your belt! The world of longboarding knows powerslides as stand up slides. Standing up and doing a slide in the middle of a race isn’t always the best idea though, it is best to play it safe, put your hands down, and you will be winning races in no time! Marcus Dalton navigating some turns via stand up slide. Tucking! That is next on our list of wonderful things that are downhill related. Having a good tuck is pretty essential. Check out this photo of Robin McGuirk in his Old-School tuck which is mandatory at the Mt. 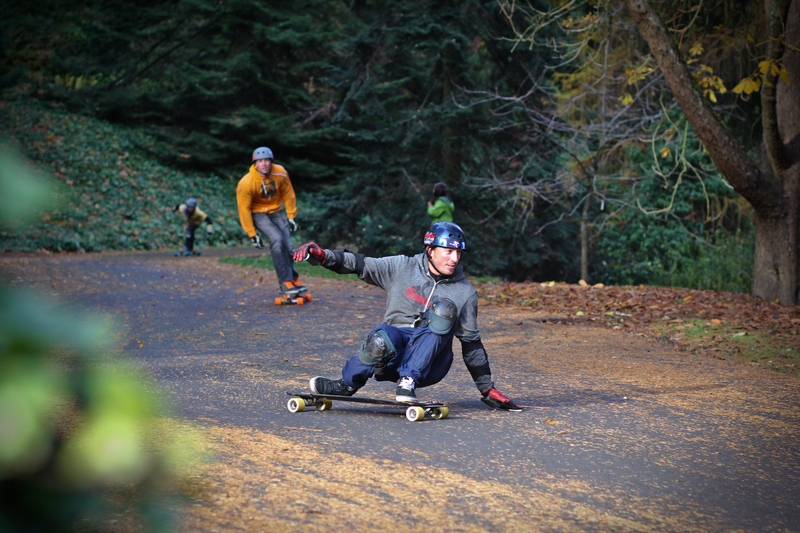 Tabor Downhill challenge. An old-school tuck is not the most ideal style of tucking but our forefathers did it so doing a little throw-back skating every now and then is definitely a blast. Old-School tucks are very dependent on placing as much weight on the front of your board as possible. Generally both feet are always touching and they are as close to side-by-side as possible. Standard tucking nowadays is much more refined! The main idea is still to have as much weight as possible on your front foot closest to the front of the board. Your back foot is used as a secondary balance point and for controlling slides and drifts. Some people still have much better tucks than others though and that is what separates the young pups from the big leagues! There is actually a lot more to tucking than one would think. On a long course with big sweeping turns you don’t have to break tuck like you do when you have to slide and drift. When you stay in your tuck for extended periods of time, only making minor adjustments in weight distribution and footing, your legs get really tired really fast! You actually feel bits of relief here and there when taking corners due to centripetal force. It allows you to take more weight off of your legs when leaning throughout corners and turns. A tuck that has good form has great aerodynamics and this will really come in handy when drafting other riders. When you are in another riders draft you want to sling shot yourself ahead of them when the time is right. When you do this you will break away from their draft and if you have little aerodynamic resistance you should be able to pass by them with ease. It is actually a pretty cool feeling when you do it; it is a technique you can go on to perfect with time. In order to draft a rider or group of riders you are going to have to be comfortable riding in very close proximity to other riders. This is called “Pack-Skating.” Pack-skating requires a lot of trust in the other riders around you. You have to trust in their abilities as riders and that they won’t fall in front of you going 50+ miles per hour. The reason why you have to trust them is because you have to be fully focused on your own riding and what your plan of action is. Pack-skating takes some getting used to but as soon as you can train yourself not to worry about the people around you the closer you will get to becoming an even better downhill rider. Downhill riding has so many techniques but one of the most important ones out there is navigating a course properly. You need to know how to carry the right amount of speed up until you reach the apex of a turn without risking the chance of scrubbing out and falling down. Choosing your lines and sticking to them is something that every skater has trouble with on occasion. It is the reason that some riders will go from first place to dead last in 4 or 5 man heats. Sometimes holding your line means coming dangerously close to other riders and this is a huge reason why you see so many bails near the end of a race. Your line may cross paths with another riders line and if you give up on your line you could lose a huge amount of speed and potentially sacrifice your position in the race. Generally taking the inside position of a turn will allow you to pull out ahead of everyone else but at the same time everyone is going for that inside spot. If your timing is right and your skills are there you should be able to cut in just right and move up the line! 2012 Juniors Finals at Maryhill. Holding their lines! Downhill riding gives you so much of a rush, the feeling is unexplainable! This is why downhill skateboarding has become one of the most popular board sports in the world. 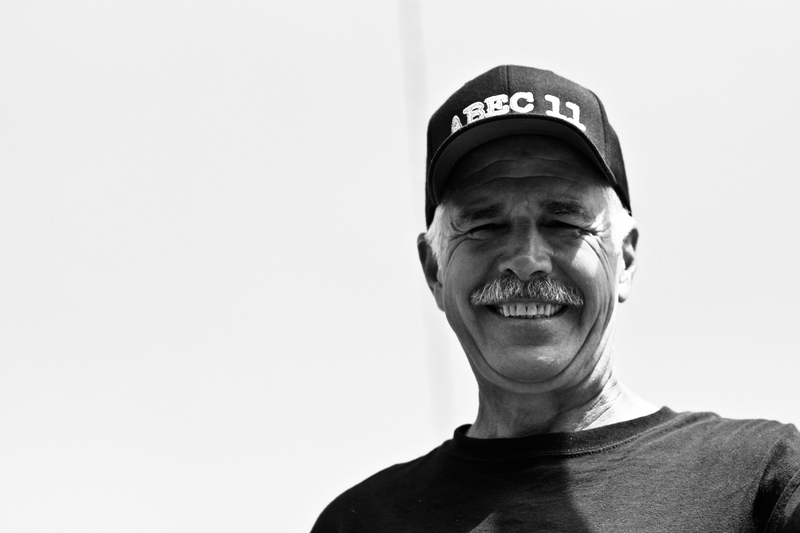 The benefits of racing with good etiquette and within your skill levels are amazing. Winning events can lead to so many new opportunities in your life. Sponsors will seek you out, fly you around the world to new races and events. You will make new friends and be able to see things that you would have never been able to see otherwise! Granted, not everyone is going to get to that level but then again not everyone wants to! The feeling of camaraderie when skating with a few friends at high speeds is awesome and it is also a great way to connect with new riders. All in all we are a bunch of skate-nerds who want to have fun and hang out doing something we all love. It is cliche but spreading the stoke is what it is all about. Spread the stoke and good things are bound to come to you! Now go bomb some hills kids! Max Wippermann and Wolfgang Coleman bro-hugging it up. 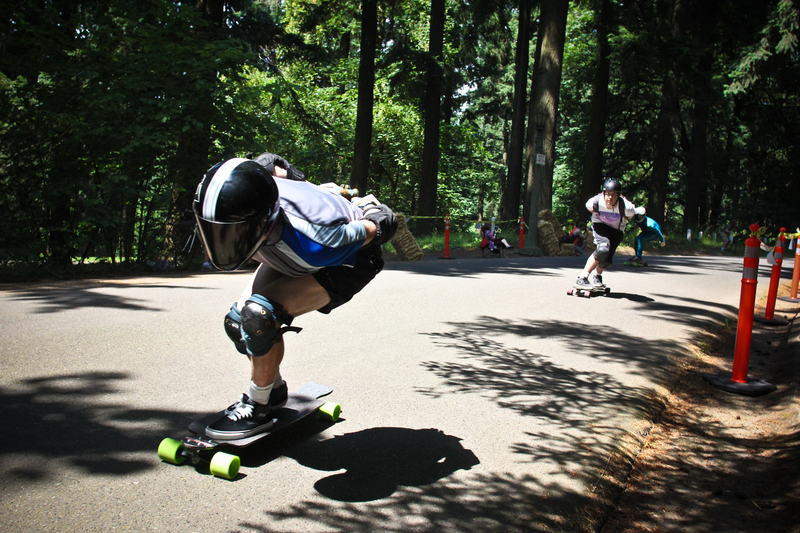 This entry was posted in Uncategorized and tagged abec 11, canon, daddies board shop, downhill, editorial, fun, landyachtz, life, loaded, longboard, longboarding, love, orangatang, oregon, photography, portland, racing, rayne, sector 9, sports by Spencer Morgan. Bookmark the permalink.